Needham Market is a busy little town, more a large village really, just off of the A14. It is close enough to Ipswich and Stowmarket for the big supermarket chains to have ignored it, and so it still has a good selection of local shops, including a decent art supplies shop, as well as six pubs. I like it a lot for this. 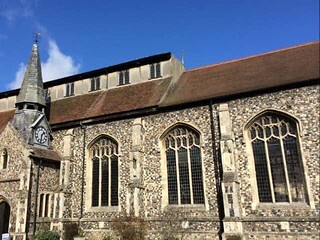 St John the Baptist is quite different from any other church in Suffolk. It has an urban setting on the main street, hemmed in by old buildings on three sides. But this is no grand town church, and you might not even notice it if it wasn't for the curious little spire on the porch, and the high clerestory like the bridge of a ship. Indeed, this church was just a chapel of ease to Barking until 1901. It has no churchyard, and there is no tower. It was built during the second half of the 15th century, and set in the expanse of restored knapped flint is an inscription carved in stone: Pray we all for grace, for he yt hav holpe ys place God reward he for her ded & hev'n may be her meed. There is an archway in the north east buttress. This was to allow the Corpus Christi procession to encircle the church without leaving consecrated ground. St John the Baptist underwent several massive restorations in the late 19th century, but it is still a goal for church explorers seeking the finest that the late medieval period has to offer, because this is one of the great Suffolk church interiors. You step inside, and find yourself far beneath a roof which seems impossible. To look up into his extraordinary double hammerbeam roof is like looking down into the hull of a ship, and a feeling of vertigo would be completely understandable. Cautley thought it had no equal in all of England. The wall plates emerge into coving which hides the tops of the walls and creates a church in the sky. An 18th century ceiling was removed in the late 19th century to reveal the roof, which at that time was continuous through the nave and the chancel. The nave part was then raised, and the north clerestory was added to match that on the south side. The angels are Victorian, and are fine enough. St John the Baptist was obviously a star of the High Anglican tradition. The glass in the east window depicts Christ on the cross above the agnus dei symbol of the church's patron Saint, and there is another agnus dei on the late 19th century font. In 1953, a rood screen was reinstated, but in the mid-1990s it was taken out again, and reused as panelling behind the altar. The white walls are lined with what must be one of the best sets of Stations of the Cross in Suffolk. They were installed in 2000. The south door is modern, but it preserves panels from the medieval door which was probably the original. Another 15th century door, a more unusual survival, is the priest entry to the chancel. The church is obviously a busy, lively focus for this lovely town. But the world does not stand still, and I am told that St John the Baptist is about to undergo a reordering. 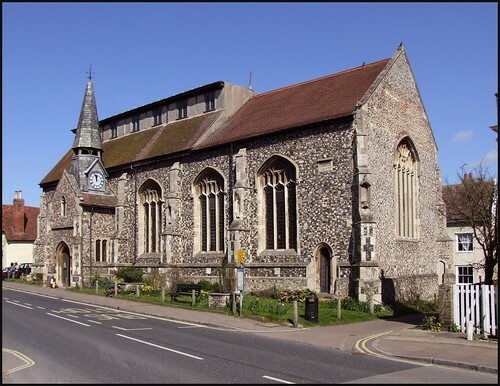 The plan is to make it suitable for daily use by both the church community and the people of Needham Market as a whole. Part of the plan is for a nave altar set at right angles to the high altar, allowing a church in the round while preserving the traditional arrangement. I look forward to seeing it. This is a lovely, living church preserving the best of its past in a building suited to the future.